In continuing the theme of listing some of the things here in the Rocklin area which I couldn’t find in the South Bay, I present to you Mel’s Drive-In. You may recall Mel’s rose to prominence in the movie American Graffiti. Then again, maybe you’re too young to have even heard of the movie. In any case, Mel’s became something of a cultural icon during the 50s and 60s. Mel’s diners are still out there, and many have captured the feel of the era in which it was most popular. The one in Roseville is in a strip mall, so it doesn’t quite have the retro feeling when you look at it from the outside. Once inside, you’ll see lots of pictures, particularly stills from the movie and autographed pictures from George Lucas and others who were featured in the movie. At the time, they were nobodies, but today, they’re household names. Ron Howard, Harrison Ford, Suzanne Sommers and many others appeared in that wonderful movie, which was filmed in my home town of Petaluma, California. Back to Mel’s. Anyone who knows me knows I love to eat breakfast at just about any time of day. Mel’s is open 24 hours, and last night, I enjoyed the #4 combo of 2 eggs, 3 slices of bacon, hash browns and sourdough toast. Mmmmmmm, I loves me some late night breakfast! At each table, you’ll find a little mini jukebox in which you’ll find dozens of songs from the 50s, 60s and 70s. There must have been a Beach Boys fan in the house last night, because during my meal, I must have heard at least 3 songs. I didn’t mind. I like the Beach Boys. Mel’s Drive-In, good food, open 24 hours, reasonable prices, and the retro feel help you forget about the stresses of today. Definitely a redeeming quality! You may notice that the Redeeming Qualities that will appear up front will be food services. So far, aside from furnishing my place, restaurants will likely make up most of my new experiences during my first few weeks here in the Rocklin area. With that being said, I present to you Sonic – America’s Drive-In. I used to travel throughout the United States back in my younger days as a professional singer. I noticed that, particularly in the South, Sonics were a significant part of the fabric in many small towns. I don’t know what it’s like in those areas today, as that was more than 20 years ago, but cruising was a pretty widespread phenomenon back then. And it seemed that the Sonic was always the point at which cars would make the turnaround to head back in the other cruising direction. There is no cruising in Rocklin, but there is a Sonic here which opened up just within the last few months, I’m told. It comes complete with carhops…on roller skates! 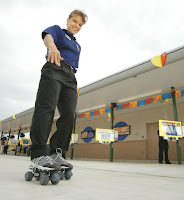 As a sign of the times, some carhops are sporting roller blades, but the spirit is still the same. The food is ok. I haven’t eaten at a Sonic in over 20 years, and I can’t say the food is the drawing card. The retro feel of pulling up to a spot and having your food delivered to your car window by someone on roller skates/blades is pretty much the draw. It also appears that you can sit outside and not only order your food from the patio area, but even pay for it with your credit/debit card without having to wait in line. This is particularly handy when trying to avoid poor customer service. A recent example would be the Wendy’s I hit with Lisa and Brenda after we started to drive back to Rocklin Saturday after cleaning out my apartment in San Jose. There were a minimum of 6 employees behind the counter, and only one gentleman waiting for his food. There were times when as many as 3 of the employees were consumed with helping that individual by placing fries, drinks and burgers on his tray. Meanwhile, no one bothered to approach the tired and hungry new customers who were patiently waiting to give their order. We waited and waited for more than 5 minutes, with no one in line ahead of us, before one employee finally stopped to take our order. And even after doing so, he still messed up our order. Sonic, decent food, fun ambience. One feature I plan to make part of my blogging will be things I find here which are unique from the Bay Area. Not necessarily better, so put your torches and pitchforks down. Just stuff I didn’t find while living in the South Bay. These items are not listed in order of significance, but in the order of discovery. Today, I would like to highlight my lunch furnished by Chick-fil-A. Let me tell you, there is no better fast food chicken anywhere. I had intended to have lunch there Sunday as a re spite from my unpacking, particularly since it’s in very close proximity to the Wal Mart which has become a regular destination during this process. However, Chick-fil-A is closed on Sundays. 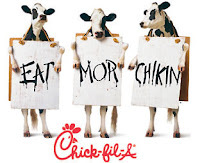 Like In-n-Out, Chick-fil-A was founded by Christians, and they close all their stores on Sundays. My spirit and my tummy are both well fed! Well, after a whirlwind month, or at least several weeks, I’m settling in to my new abode in Rocklin, CA. It’s amazing to believe that one month ago today, we were on the eve of Celebrate America at the Shoreline Amphitheater in Mountain View. At the time, I hadn’t made an official decision to move, and now…here I am. Last week is a blur. I crammed more into the last 8 days in San Jose than I think I had experienced in 8 weeks. And you know, I still didn’t get everything done that I would have liked to. I didn’t get to see everyone I would have liked to have spent time with, I didn’t get to sneak in one more golf game with my favorite golf buddy, John. I didn’t get to catch the ballgame with Troy, and so on. Tomorrow night in San Jose, the Bethel women’s softball team plays their next game. Here in Rocklin…I have no idea what I’m going to do. Starting over is brutal. Life goes on. It’s back to work for me in the morning. My internet and phone are all hooked up and ready to go, but most importantly, my cable and high definition splendor is up and running! Right now I’m watching the Giants do their best to hold off the Dodgers. The Giants have squandered all but one run of what was a seven run lead. Do you have a place to live? Do you have a job lined up? Questions 2 and 3, in my case, are necessary because most people relocate to another community for at least one of those two reasons. In my case, those reasons are not truly the motivation. In fact, I don’t have any single particular tangible reason to move and leave the city, church and friends I love. Instead, I’m moving without having a single clue as to what lies beyond even next week. I mean it. That’s really true. I was speaking with my dear friend Lisa on Friday by instant messenger. She succinctly put into words what I have been desperately trying to communicate and grasp for my own understanding. During our conversation, all I could think was “this is a blog waiting to happen”. Call me a prophet because she wrote about it later in the day. You can read what she wrote here. 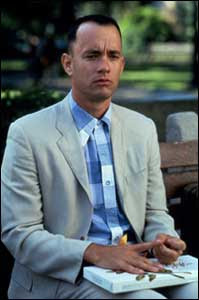 I consider myself something of a spiritual Forrest Gump. If you recall in the movie, Forrest just seems to meander his way through life without any real ambition or plan, yet he somehow lives an extraordinary life which affords him the opportunities of meeting presidents, being a hero, inspiring others, witnessing history, and even making history. The movie weaves a thread through the events of his life which are seemingly incongruous. For example, he is running away from the town bullies, only to race the length of a football field during a team’s practice at such a rate of speed, the head coach can’t help but get that kid on his team where he enjoys an impressive football career with a college football powerhouse. Back to Lisa’s post and whatever it is I’m trying to say at 12:45 am of my last day in San Jose. I have no tangible expecation in this move. I am not moving to make my fortune in some industry. I’m not moving to be an integral part of a specific ministry in a particular church. I’m not moving because I have met the woman of my dreams and prayers. I’m not moving because I’m buying my dream home. I’m moving because it’s the hardest thing for me to do. Excercise is difficult. It’s not meant to be easy. But it is good for us. It is necessary for development. It is necessary for our health. I’m excercising my faith in a way I’ve never had to before. Any one, or all, or none of the things I listed in my previous paragraph may come to pass as a result of this move. I have no idea. But I am trusting that the Lord has something in store for me on the other side of this transition. I don’t know what it is, but I’m believing I will be a better man for this experience. I think Forrest and his mother looked at life incorrectly. Rather than seeing life as a box of chocolates in which you “never know what you’re gonna get”, I know that when I open that box, I’m going to find a bunch of chocolate. No surprise. I trust the contents of the box are going to be consistent with what the label said I’d find inside. The adventure and treasure in life comes by taking a bite and seeing what goodness lies on the inside. blessed are those who take refuge in him. …or if I’ve just packed it away. My apartment looks like a war zone. Empty boxes, full boxes, partially filled boxes, boxes boxes boxes. This has been a crazy week. 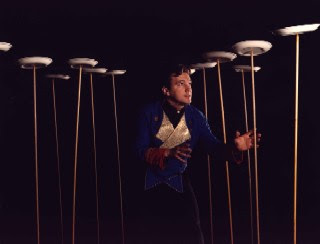 Juggling 2 jobs, packing, address changing, changing the service address with PG&E, renting a U-Haul, getting cable/internet/phone installed, blah blah blah. It hasn’t been a three ring circus, it’s felt like about eight or nine rings. I pretty much feel like this guy. Part of my problem is focus. I start focusing on this “plate”, and meanwhile the one behind me, to the left, is really getting wobbly. So I start working on that one, then the one to the right starts to teeter. It’s taking everything I’ve got to keep everything from crashing into a mass of broken pieces…and not becoming one of the shards, myself. On another note, the ladies of the softball team sprung on me their desire to take me to dinner tonight. Anyone who knows me knows I’m a pretty staunch carnivore, so why not go out with a bang at Outback Steakhouse! I’m really looking forward to seeing my friends one more time before heading out tomorrow. I can’t say I’m excited to leave and move, but I can say I am strongly looking forward to this whole transition being behind me. Much like my brain, this post is somewhat scrambled and disorganized. Hopefully once I can settle in, my writings will be more entertaining and thought out. Right now I’m just brain-dumping. I doubt I’ll write anything tomorrow, and I reserve the right to flake on the entire weekend. But we’ll see. I need to take care of a couple wobbly plates now. There’s No Crying in Softball! Tonight is, what I expect to be, my last significant “goodbye” before moving on Saturday. This evening is game #2 of the 2008 summer softball season for the women’s softball team I’ve been coaching for I don’t know how many years. Melinda originally asked me to come out and help how ever many years ago, and I just kind of stuck around. I can’t even communicate in words how fun it has been with this team. Some players have come and gone during my tenure, many are part of the team today who were part of it long before I came along. Every single person who has come through our dugout in a Bethel jersey has been a character in one way or another, and brought intangible qualities which has made the experience so much fun. While I’m sad to say goodbye to these ladies, I think there will be a whole lot of laughs through it all. We love to win, but even in defeat, these ladies give it 100%. I’m so proud to have been part of it, and I’ll miss them. I expect to post one or more photos from tonight’s fun soon, so stay tuned!